↑ 2.0 2.1 2.2 Bressett, Ken. "Tea Money of China". International Primitive Money Society Newsletter (44, August 2001). ↑ "Tea production (2015-16)" (PDF). www.teaboard.gov.in. Tea Board of India. สืบค้นเมื่อ 23 September 2016. ↑ "Tea production (2015-16)" (PDF). www.teaboard.gov.in. Tea Board of India. Retrieved 23 September 2016. ↑ The Tao ofTea. "Vietnamese Tea". Archived from the originalon 2007-10-29. Retrieved 2008-01-30. 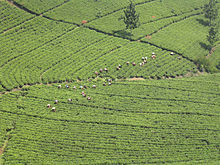 ↑ "India the world’s largest producer and consumer of tea". Retrieved 5 January 2018. หน้านี้แก้ไขล่าสุดเมื่อวันที่ 2 กันยายน 2561 เวลา 07:45 น.